In 2009, the Federal Trade Commission (FTC) came out with guidelines regarding disclosure of endorsements that were significantly updated to take into account the ever-expanding domain of online advertising and social media. The underlying purpose was straight forward – that word-of-mouth advertising campaigns online should, in fairness to consumers, disclose when someone writing a review, talking about a product or otherwise promoting a product of business, was being paid or compensated for their services. Reading and then understanding said guidelines in the Federal Register caused many a migraine for marketers. In response, using my expertise as an attorney, I compiled a quick flowchart which summarizes the important points for bloggers and podcasters alike helping them to understand when disclosure was necessary. Since that time in 2009, the world of social media and social media marketing has grown and changed dramatically. When each new digital and social channel comes along, they are often quickly followed by new, creative ways to use the channel for marketing. As a result, the FTC has had to play a constant game of catch-up to make sure that consumers have a fighting chance to sort out authentic comments from friends about the latest trend or product, from those that are posting and working as an “influencer” at the behest of marketing firms. First of all, the FTC has actually done a great job in the new guidelines (and in the shorter and sweeter FAQ) to cover social media promotions and endorsement scenarios, and anyone who is producing content or sharing posts about products, services, and brands online should give them a read. It’s not painful, I promise. In blog posts, Facebook updates and the like, where post length is not much of an issue, a writer should basically disclose whether they received a product for free or received payment for the post about a brand, product or service in the text. For agencies, this means disclosing posts that mention clients as clients is important, and making sure any influencers employed for promotional purposes know specifically what their disclosure obligations are, in order to stay within the rules. This is important because if the FTC takes issue with a campaign, everyone from the influencers to the marketing company to the Brand are subject to substantial fines for not following guidelines. Given the FTC’s recent enforcement actions, we suspect that this means everyone has been put on notice, so to speak, and we can only expect that fines will get larger and uglier in the future. The questions about disclosure start to get trickier when we start talking about marketing campaigns on platforms like Twitter, Instagram, Pinterest, SnapChat and the like. With limited space, what constitutes adequate disclosure? Add in the emergence of mobile and mobile marketing, and it is a brave new world of advertising and required disclosure to avoid fines. In recent decisions discussed in more detail below, the FTC has hinted that hashtags such as #ad, #sponsored or #client would be adequate. Some sort of disclosure has to take place, and it’s pretty clear that the disclosure needs to accompany the content, not be hidden in someplace more obscure, such as in a profile, or elsewhere on a website. 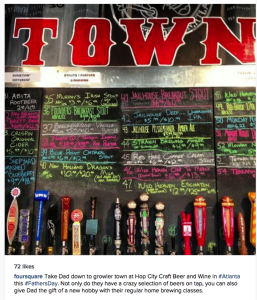 This post about a craft beer place in Atlanta from Foursquare looks ok, but the hashtags used are pretty generic. If Hop City is a paying client of Foursquare, then ideally, a disclosure such as #ad or #client or #partner should be used to make sure Foursquare is not doing this just out of the kindness of their heart, but because there is a financial relationship between the two. If there is no relationship between the two, other than people have tagged Hop City as a place on Swarm or Foursquare, no changes would need to be made. If Foursquare is employing, either directly or through their marketing agency, specific photographers, influencers, or bloggers to go around a City and take pictures of places listed on Foursquare and post these photos to the Foursquare-owned Instagram account, what’s required? If the influencers are posting the pictures on their own personal feeds, to ideally drive traffic to the restaurant, and they are getting paid by Foursquare or its marketing agency to do so, a disclosure should be made. If they are posting to the Foursquare account, but instead of taking pictures of all the places in a neighborhood, are picking and choosing Foursquare paying customers, there’s a clear promotional purpose and exchange of value, and disclosure should be made. If these folks are not receiving anything in exchange, and are just taking pictures and letting Foursquare use them, well, that seems just fine- it’s all about the quid pro quo. The PR or marketing agency involved, or Foursquare itself could be held responsible for the failure to disclose, even if the mistake was made by a blogger/poster/photographer. Who’s Likely to Be Under Scrutiny? Monitor what they’re doing on your behalf. Quadruple negatives aside, the take-away is clear: Mandate a policy that complies with the law. Make sure your people know about it. And monitor what they’re doing. This is a clear message to all agencies that word-of-mouth promotions will require monitoring for adequate disclosure. We would highly recommend that there were written disclosure rules and distinct information about follow up distributed to employees of the agency and the selected influencers alike, and some sort or reporting/checkin schedule was set up to keep tabs on a campaign during its run. It’s inherent in human nature to start looking for loopholes or ways around the rules in any given situation. While the FTC has said clearly that each case will be driven by its facts, the cases below start to flesh out where the FTC seems to be going regarding social marketing. The FTC investigated a promotion by Cole Haan where participants could enter a contest for a $1,000 sweepstakes prize for whoever had the most creative board on Pinterest about “Favorite places to wander.” The hashtag #WanderingSole was deemed insufficient disclosure to let people know the posts were being made for a commercial purpose- the contest and the prize were big enough to constitute a material connection. While Cole Haan eventually got a “closure letter” saying they would not be prosecuted, the FTC was clearly issuing a warning it was going to start cracking down on this sort of promotion, and fun hashtags alone were not likely to function as adequate disclosure. ADT, the home security folks, also got into trouble with the FTC and had to make changes in an ad campaign where they were misrepresenting paid endorsements as independent reviews across different mediums, traditional and online. In December 2014, the FTC entered into a settlement with Deutsch LA regarding a Sony campaign using the hashtag #GameChanger on Twitter in which inadequate disclosure of the advertising was a problem. The FTC was also clear to reiterate that disclosure rules applied to social media, and it could be expected to be more stringent with enforcement in the future. It did signal that hashtags #ad, #sponsored, or #client could be enough to make sure tweets were adequately transparent. Disclosure should happen whenever there is an exchange of any value (or in the case of contests, potential value) made in exchange for online content. The disclosure must accompany the content, not hidden elsewhere, such as in profiles, or separate content, such as a second tweet. Agencies and Brands are more likely to be held responsible for deceptive content, and they are also liable for ensuring compliance from their employees/contractors/participating public, to the extent possible. A compliance/monitoring program should be part of the campaign’s rollout. Also important for agencies, Forbes also recently published an article discussing the FTC pursuing a tech company called Nomi, involved with using in store sensors (near-field communications) to track over 9 million cell phone numbers from people shopping in stores without providing an opt-out option, violating the privacy of consumers. This means before opting for a sensor-driven ad campaign, brands and agencies should be extra careful about the security of collected data, and to provide clear opt in/ opt out options for consumers. And let’s not forget the FTC also entered into a settlement with Twitter itself in 2011 for misleading consumers about the extent to which it protects their information and privacy, resulting in monitoring for 20 years as well as face a potential fine of $16,000 per violation,( ie. per tweet) of the agreement. The FTC is Serious, Folks. Everyone should also be aware that the FTC is opening a new “Office of Technology Research” to try to stay on top of a rapidly changing world of online payments, advertising, the internet of things, and the like, in an effort to keep consumers safe. The FTC has awoken from slumber, and it’s taking the job of monitoring online communication and business practices seriously. While many of the settlements and closure letters have been relatively minor, it shows they are getting serious about enforcement across the board. This month, in fact, the FTC took a surprising step, when it entered into a settlement against a failed crowdfunding campaign. An individual took money from the campaign and used it for personal expenses in part, rather than fulfilling his obligations, and the FTC stepped in to negotiate a settlement to try to make donors whole. This means even when consumers willing give money to a campaign, they may have a little more protection if things go bad, when the FTC is willing to step in to help negotiate settlements in the event of fraud. In sum, the Wild West of digital marketing has a new sheriff in town, and he’s serious about the law. Agencies need to be aware that they are putting themselves and the brands they work with in the crosshairs when working with influencers, but we must become more serious and proactive in crafting disclosures that are clear and unequivocal. While there will always be a few mistakes, the FTC has made it clear that the days of playing fast and loose with disclosure are coming to an end. To learn more about Whitney Hoffman, click here.